The swiping gesture has become so popular that your app could be considered out-dated if it does not have this feature. In fact, adding it is so easy that there is no reason for you to not add it. So, let us build a simple application that uses the ViewPager. I will be using the FragmentStatePagerAdapter for this. 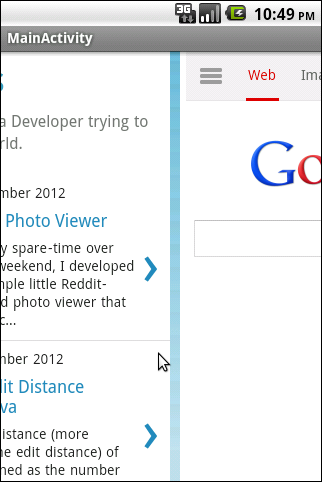 You can also use the FragmentPagerAdaper. The only difference between the two is, the former saves more memory but creates your fragment every time. By default, at any given time, it will keep at most three fragments alive - the one that is currently visible to the user, and the ones to its immediate left and right. This application we are creating now displays different websites on different pages. That is, you swipe to change the website that is currently visible. Let us create the layout of our activity first. It holds only the ViewPager. Next, let us create the layout of our fragment. It holds only a WebView. Obviously, his is the component that will be rendering the websites. Okay, now we are all done with the layouts. Let us write some Java code. First, let us create our Fragment code. I will be using the Fragment class from the support library, but you can use SherlockFragment in case you are using the ActionBarSherlock library. All we are doing in this code is, initialize the browser, and load the URL that was passed to the fragment when it was created. Next, we will write the code that makes the Activity. I will be creating a FragmentActivity, but you can also use the SherlockFragmentActivity if you are using the ActionBarSherlock library. // As you can see, this is really simple. There, that is all you need to do to use the ViewPager. Just add the INTERNET permission to the manifest, and you are ready to run it. Hope that was helpful. Let me know what you think by commenting. I would love to read your comments.